Ayurveda practitioners (APs) could be reliable scientific resources in PV reporting mechanism, but are not contributing significantly in ADR reporting due to poor knowledge, attitude and practices in this regard.,, No report is available so far on the level of knowledge and awareness on PV among Ayurveda practitioners of any northern Indian state. Considering this, we undertook a questionnaire (validated and consisted of fifteen items) based survey, during July-November 2016, of 277 Ayurveda physicians, selected using simple random sampling, working in rural and urban regions of Himachal Pradesh, after obtaining their consent to participate and informing that the participation was voluntary and assuring that confidentiality will be maintained. The questionnaire was communicated through WhatsApp to participants and they were asked to resend it after answering. The collected data were analyzed using MS Excel 2007 and expressed in percentage (%). General data on characteristics of 277 physicians is as follows: Age group (years): 25-35 = 163 (59%), 35-45 = 67 (24%), >45 = 47 (17%); Gender: Male = 192 (69%), Female = 85 (31%); Professional qualification: graduates = 266 (96%), post-graduates = 11 (4%); Working experience as physician: <5 years = 109 (39%), >5 years = 168 (61%); Type of clinical posting: Posted in government Ayurvedic Health Centres (AHCs)/sub-divisional AHCs/district/state-level Ayurvedic hospitals = 103 (37%), Posted in mobile health units under NRHM = 43 (16%), Others (Pvt. practitioners/working in NGOs) = 131 (47%). The obtained information on knowledge, attitude and practice of PV among them is detailed in [Table 1]. Though the study was of limited sample size, the findings reflect the poor knowledge and awareness of PV among Ayurveda practitioners of Himachal. The present report is expected to wake up the concerned authorities and Ayurveda stakeholders for successful implementation of NPP. Better understanding of PV among practitioners can not only assist in early detection, assessment and prevention of adverse drug reactions but also is imperative for prompt re-evaluation of marketed drugs, risk management and rational drug use. Olsson S. Pharmacovigilance training with focus on India. Indian J Pharmacol 2008;40:S28-30. Thatte U, Bhalerao S. Pharmacovigilance of Ayurvedic medicines in India. Indian J Pharmacol 2008;40:S10-2. Narayana DB, Manohar R, Mahapatra A, Sujithra RM, Aramya AR. Posological considerations of Ocimum sanctum (Tulasi) as per Ayurvedic science and pharmaceutical sciences. Indian J Pharm Sci 2014;76:240-5. Shastri PK, editor. “2nd Adhyaya” Rasantarangini. 11th ed. New Delhi: Sri Jainendra Press; 1994. p. 22-4. Singh LB. Poisonous (Visa) Plants in Ayurveda. 2nd ed. Varanasi: Chaukhamba Sanskrit Bhawan; 2003. p. 44. Parab S, Kulkarni RA, Thatte UM. Heavy metals in herbal medicines. Indian J Gastroenterol 2003;22:111-2. Saper RB, Kales SN, Paquin J, Burns MJ, Eisenberg DM, Davis RB, et al. Heavy metal content of Ayurvedic herbal medicine products. JAMA 2004;292:2868-73. Rajesh B, Devangi RD, Anjum W. Assessment of knowledge, attitude and practice of pharmacovigilance among doctors practicing alternative systems of medicine in Southern India: A questionnaire based study. Natl J Physiol Pharm Pharmacol 2017;7:1-4. Prakash GB, Subash KR, Reddy KV, Kumar DS, Prasad KJ, Rao KU. 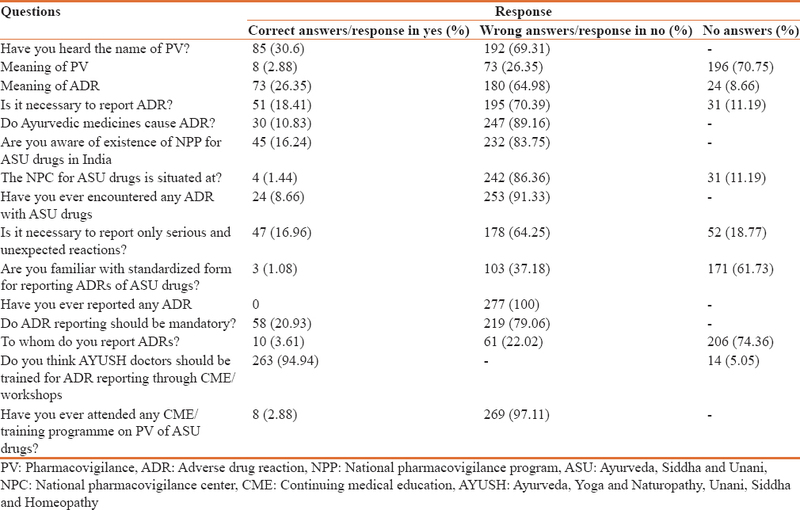 Knowledge, attitude and practice of pharmacovigilance among Ayurvedic practitioners: A questionnaire survey in Andhra Pradesh, India. Natl J Physiol Pharm Pharmacol 2016;6:475-9. Arun M, Bharat K, Akshay K, Sambit D, Subrat J, Debasish P. Knowledge, attitude and practices of ADR reporting among practitioners of Indian medicine (Ayurveda): A survey in Odisha, India. World J Pharm Res 2015;4:1602-9.